LG plans flexible, rollable TV for CES 2016 | What Hi-Fi? LG is planning to show off a flexible OLED TV you can roll-up as part of its push to show OLED as the key display technology for the future. 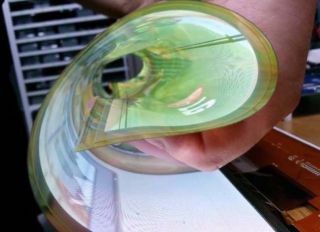 We've seen curved TV screens, we've even seen bendable TVs, but now LG wants to take flexible displays to the next level with a 'rollable' TV. The TV would use LG's OLED screen technology alongside curved or even wire batteries to make the TV set portable while keeping it flat. This combination of screen and battery technology would allow you to roll up your TV and carry it with you. The 55-inch flexible TV is also tipped to use a transparent display, potentially making it even more versatile. LG's roll-up TV is said to be nearly ready in prototype form, so could be demonstrated at CES 2016, which gets underway on 6th January next year. LG showed-off a bendable TV that could move at the touch of a button back at CES 2014 - as did Samsung, unsurprisingly - and there were more flexible TVs revealed at CES 2015. But these sets move from flat to curved by a matter of inches - LG's latest take on this technology aims to take the bend a lot further. It's not the first time LG has shown off flexible screens, though its the first we've seen anywhere near this size. Previous versions have featured much smaller, flexible screens using AMOLED, TFT and LCD technology. A public display would suggest this 55in rollable OLED is a little further along the production process than some of the previous prototypes. But don't go throwing away your current TV quite yet. Even if we do see rollable TVs at CES 2016, it's still likely to be a few years before they make it to mass production.